These beautiful posters help students appreciate and interpret the rich and varied works of some of the greatest artists who ever lived. 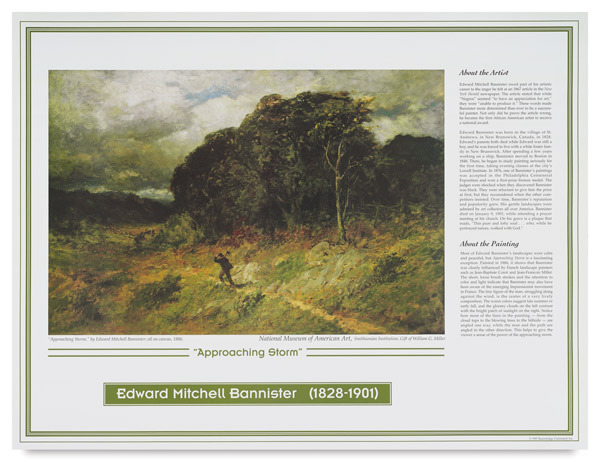 Each poster features a full-color reproduction of the featured work, background information, possible interpretations of the painting, and biographical information on the artist. They are printed on heavy, coated stock and measure 19" × 25" (48 cm × 64 cm). Notable Women Artists, Set of 5 — This set includes In the Dining Room by Berthe Morisot, Self-Portrait with Monkey by Frida Kahlo, Jack-in-the-Pulpit No. IV by Georgia O'Keeffe, Les Fetiches by Lois Mailou, and Little Girl in a Blue Armchair by Mary Cassatt. African American Artists, Set of 8 — This set includes School's Out by Allan Rohan Crite, The Eclipse by Alma Woodsey Thomas, Approaching Storm by Edward Bannister, The Library by Jacob Lawrence, Brothers by Malvin G. Johnson, Design Made at Airlie Gardens by Minnie Evans, The Janitor Who Paints by Palmer Hayden, and Going to Church by William H. Johnson. Twentieth Century Art Masterpieces, Set of 10 — This set includes Still Life by Paul Cézanne, The Persistence of Memory by Salvador Dali, Cape Cod Evening by Edward Hopper, Watercolor (No. 13) by Wassily Kandinsky, Woman with Exotic Plant by Henri Matisse, The Hunter (Catalan Landscape) by Joan Miró, Cow's Skull with Calico Roses by Georgia O'Keeffe, Still Life by Pablo Picasso, Orange and Tan by Mark Rothko, and The City from Greenwich Village by John Sloan. Masterworks of Art, Set of 8 — This set includes The Skater by Gilbert Stuart, At the Moulin Rouge by Henri de Toulouse-Lautrec, Still Life: Apples on a Pink Tablecloth by Henri Matisse, Ginevra De'Benci by Leonardo da Vinci, The Boating Party by Mary Cassatt, The Lovers by Pablo Picasso, The Mill by Rembrandt van Rijn, and Farmhouse in Provence by Vincent Van Gogh. Masterworks of Art 2, Set of 8 — This set includes Water Garden at Giverny by Claude Monet, Dance Examination by Edgar Degas, Frida and Diego Rivera by Frida Kahlo, Exotic Landscape by Henri Rousseau, Parade by Jacob Lawrence, Young Woman with a Water Pitcher by Johannes Vermeer, The Peasant Wedding Feast by Pieter Bruegel, and Snap the Whip by Winslow Homer. ™ Knowledge Unlimited is a trademark.